One of the main reasons I love creating jewelry so much is that there are so many fun techniques to explore! I mentioned in my last post that I attended a weekend enameling workshop last Fall. Oh, the possibilities are absolutely endless! Sure, adding fun, colorful elements in the form of beads and other findings is nice. But to be able to create your own custom designs and bring new ideas to life in ways you never thought possible? It’s the cat’s meow, as far as I’m concerned! So, what exactly is enamel? Enamel is essentially finely ground glass powder that is applied to a base metal, most commonly copper or fine silver. The powder is melted and adhered to the base metal by applying heat. This can be achieved with a kiln, or as it is in my case, with a torch. Torch firing is as instant gratification as it gets! The drawbacks being that you can only fire one piece at at time, as well as having size constraints. You will not be able to fire an enamel bowl with a torch! Currently I am mainly focused on torch fired enamel, but look forward to including some sgraffito pieces into my designs very soon! Here are some brief explanations and examples of each technique to give you an idea of what I’m talking about. As the name implies, the enamel is melted onto the surface of the base metal by means of a very hot torch. I have used my Little Torch, but prefer my MAPP torch overall. You can also use a butane torch, but you won’t get very far with the small one! Vitreous enamel powder melts from around 1400 – 1600 degrees Fahrenheit. Each stage is named after the appearance the enamel powder takes on while firing. With enameling it is important to apply a coat of counter enamel to the backside of the fired piece to prevent the front from eventually cracking. Found out the hard way that this is indeed true! Insert not so happy face… Oh well, I knew better and tempted fate anyway! Designs can be changed by layering subsequent colors and elements like glass chips and strings into the previously fired surface and re-firing them. Endless design possibilities. I am currently placing my pieces on special trivets perched on a tripod with a wire screen, but they can also be placed on a mandrel like beads and dipped into enamel powder throughout firing. I am currently not set up to try to fire this way, but sure do want to try! Here are some examples of pieces I have created so far! I love combining rustic copper elements with the vibrant enamel colors. For now I have been playing around with many familiar shapes, adding color to some of the designs that sported other textures. I am also creating the same or very similar designs with different base metals and varying colors. Like this slightly lighter version of the moon pieces above! This technique requires the application of a liquid porcelain base layer front and back. Designs are then scratched into the front before various translucent enamel colors are applied. One of my absolute favorite artists employing this technique is Anne Havel. Not only does she have an amazing eye for combining simple shapes and colors, but her settings are just stunning. It wasn’t easy to pick just one example of her work, but you can find many more on Pinterest. Just so gorgeous! Do be sure to check out more of her work, you won’t regret it. 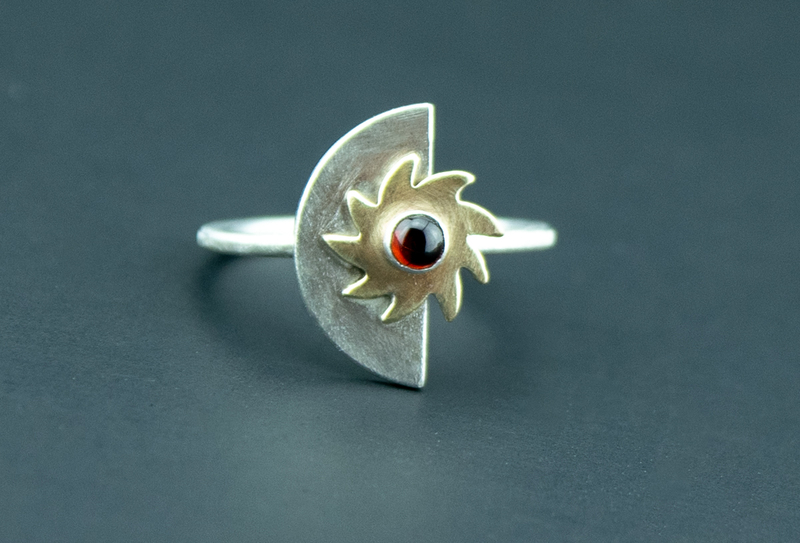 Angela Gerhard is another enamel jewelry artist to check out! Do swing by her site! I will write a more in depth post once I get started and learn more about this technique. The third technique is cloisonne which you will probably know from Faberge eggs. This technique dates back to ancient times and is the most complicated and involved of all enameling techniques. It is essentially an inlay process that requires great skill and patience. In ancient times gemstones were used as well as ground glass powder that is painstakingly packed in defined patterns. Cloisonne is seen in decorative objects as well as jewelry. You can delve into the history, technique as well as famous examples here. And that is my brief intro to vitreous glass enameling for you! I hope you’ll stop by my shop to see what’s new. I try to add new pieces regularly. If you see a design you like, but would like to have it in a different color, just give me a shout!